This easy apricot chicken recipe is the ideal weeknight dinner. It’s flavorful, healthy and incredibly satisfying. 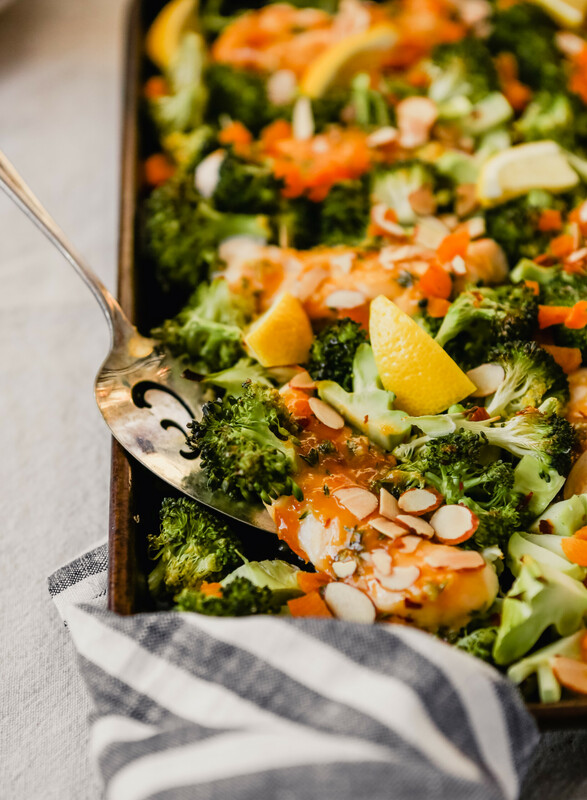 Plus, all the components can be prepped ahead of time, which means this one-pan chicken and vegetable recipe is also great to add to your weekly meal prep! Apricot and chicken pair incredibly well, and this quick one-pan chicken dinner exemplifies just that. 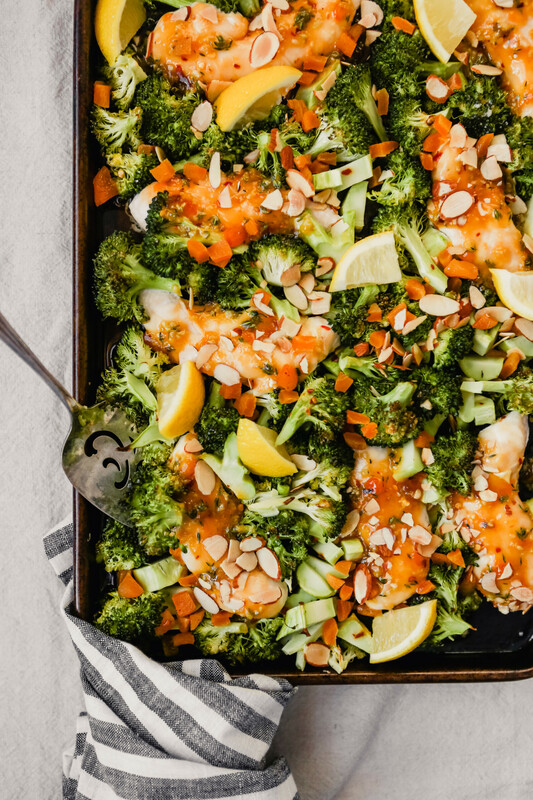 An uncomplicated apricot glaze dresses up the chicken tenders that then get roasted alongside simply seasoned broccoli florets. The whole heap gets finished with chewy dried apricots, almonds and lemon wedges. This is what I call easy gourmet! Apricot glaze can be made a myriad of different ways. From incredibly uncomplicated to more in-depth, it all comes down to what you’re looking for. This apricot glaze recipe requires just 5 ingredients (not counting salt or olive oil) and requires no stove-top cooking. Plus, it takes less than 3 minutes to make! And all you have to do is whisk it all together! Other apricot glaze recipes call for the addition of some type of liquid—water, orange juice, lemon juice, wine, vinegar—and subsequently require a bit of simmering on the stovetop to thicken. If you’re willing to add a bit of cooking time, fresh orange juice is a great addition to apricot glaze. Add these other chicken recipes to your weekly meal prep! 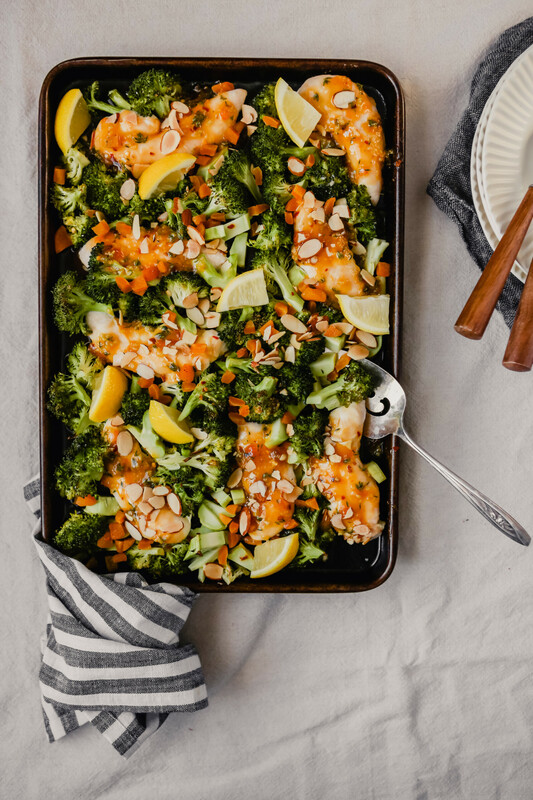 This easy apricot chicken recipe is perfect for busy weeknights! Ready in 30 minutes, it’s a delicious dinner that will satisfy the whole family. Heat oven to 425° with rack set in middle position. 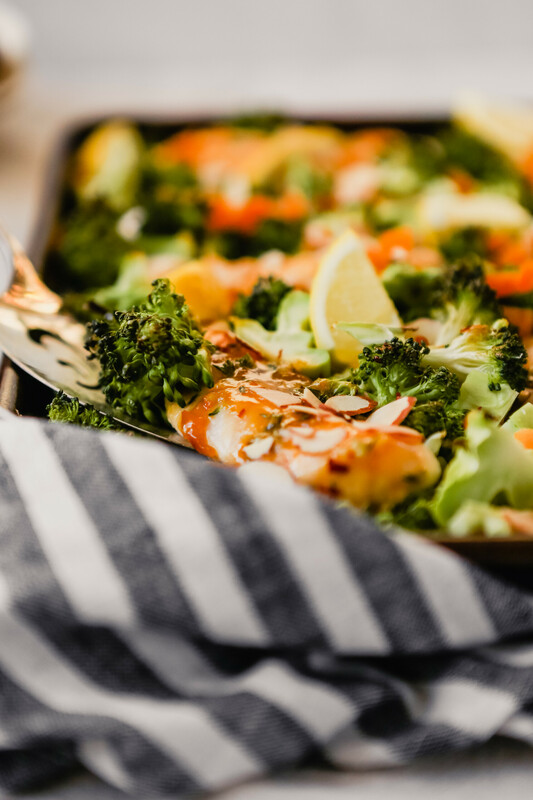 In a large bowl, toss together broccoli, 1 tablespoon oil, ½ teaspoon salt, and ¼ teaspoon red pepper flakes; transfer broccoli to a baking sheet. In now empty bowl whisk together preserves, remaining tablespoon oil, garlic, Dijon, thyme, remaining 1 teaspoon salt and remaining ¼ teaspoon red pepper flakes for the glaze. Nestle chicken among broccoli on sheet; brush chicken with half of the glaze. 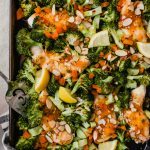 Roast broccoli and chicken for 10 minutes then brush chicken with remaining glaze and stir broccoli. Continue to roast until an instant-read thermometer, inserted in the thickest part of the chicken tender, registers 165°, about 10 minutes more. 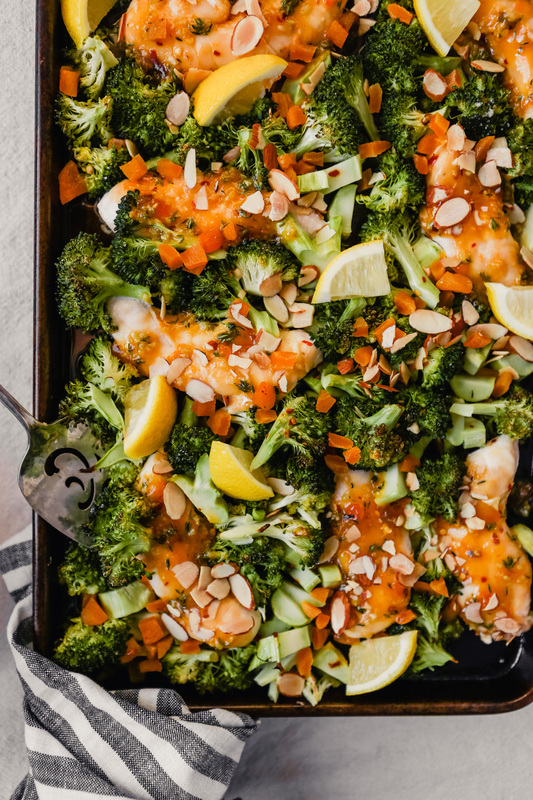 Sprinkle apricots and almonds over the chicken and broccoli and serve with lemon wedges. 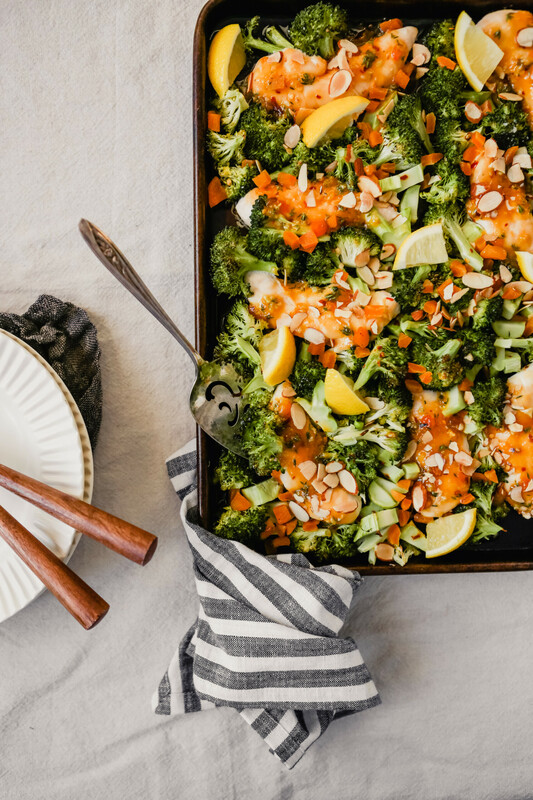 Keep this recipe on rotation and swap the broccoli out for whatever veggies you have on hand! This recipe was originally developed by me, Lauren Grant, for Cooks’ Emporium.